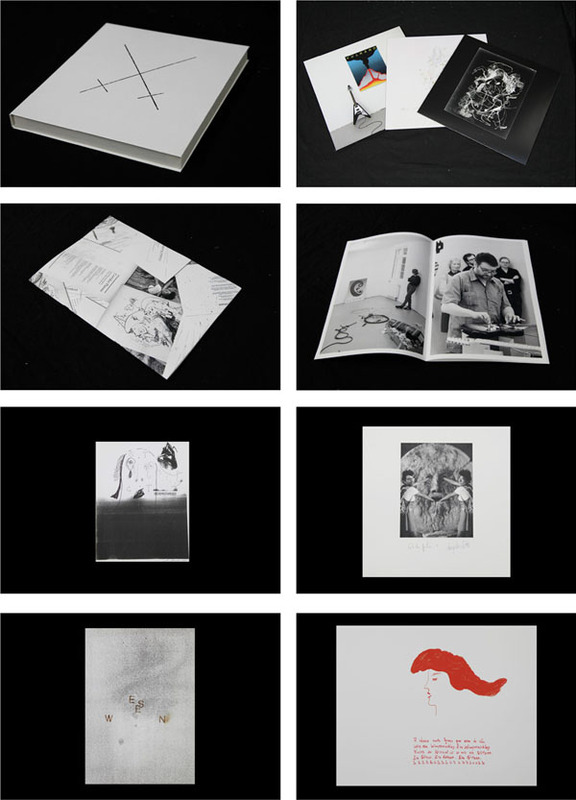 To sum up the exhibitions at Kunstverein Schwerte in 2011, the artist directors Markus Karstiess and Christian Freudenberger decided to package the Vinyl editions of the exhibited artist/musician collaborations by Angela Fette and Christian Jendreiko (AE011), Rosilene Luduvico and Volker Bertelmann aka Hauschka (AE012), as well as the "Corridor Plateau" group with Tolouse Low Trax aka Detlef Weinrich, Peyman Rahimi, Michael Bauer and Thomas SchÃ¼tte (AE013), combine them with a 70 page catalogue and original signed artist editions. Most of the artists contribute one original artwork or a small edition to the box set. Michael Bauer adds original ball pen drawings on an artist selected photocopy. Peyman Rahimi contributes a contourless monocoloured lithography with his trademark set of letters reading W.E.S.E.N. brandmarked on the print. Angela Fette and Christian Jendreiko add a series of signed laser prints of the original photomontage of their "Orakel Konkret" collaboration. Rosilene Luduvico selects a handmade single colour screen print depicting an outline drawing in combination with lyrics used on her record. The A4 size black and white catalogue designed by Adeline Morlon documents within 70 pages the actions, concerts and preparations at the Schwerte Kunstverein in the year 2011. Also documented is the excursion of the Corridor Plateau show to its second incarnation at Eastside Projects, Birmingham, UK at the end of 2011. The Kunstverein Schwerte is located in an 100 year old freestanding wood frame house near the cities center. Schwerte is one hour away from the regions cultural centers DÃ¼sseldorf and Dortmund. Around 25 years ago a group of local art lovers initiated a non-profit Kunstverein and self-curated a long series of remarkable contemporary art shows until 2009. Between 2009 and 2011 the Kunstverein Schwerte decided to transform its organisation into an artist led artspace and so became an unusual nonconformistic place for contemporary exhibitions with a focus on artist collaborations and original interventions with a sense for long term collective learning processes. Esspecially the 2011 exhibitions found a recognition within the art community and led to the unusual solution to organise free rides for out-of-towners, picking up the Schwerte friends in DÃ¼sseldorf city center with tourist busses. To extent the cultural connection to a greater region, the artist directors Markus Karstiess and Christian Freudenberger initiated interventions at Salon des Amateurs, DÃ¼sseldorf or Kunsthalle DÃ¼sseldorf, such as musical and filmic events, like a concert by the Parisian diasporic singer composer Ghedalia Tazartes. The Schwerte Box edition is limited to 35. Catalogue designed by Adeline Morlon. Apparent Extent 2012 in collaboration with Kunstverein Schwerte.